Pecan Pie has always been my favorite pie. One problem with making it here in Austria was that all the recipes I could find called for corn syrup as one of the main ingredients. Since corn syrup has never been available in Austria, I brought it back from the U.S. myself. I was curious if there was a way to make the Pecan Pie I loved without corn syrup. Internet searches revealed corn syrup substitutes and I once made a Pecan Pie using agave syrup but it didn’t come close enough in flavor and texture to the Pecan Pie I loved. Happily for me, corn syrup has gotten a bad rap in recent years and other bakers have also been looking for alternatives to the corn syrup-based Pecan Pie. While getting ready to bake pies for Thanksgiving this year, I found this recipe from King Arthur Flour which, amazingly, doesn’t require any syrup at all, their argument being that Pecan Pie existed before corn syrup was invented. The recipe met all my criteria: it called for everyday pantry ingredients, was as easy to make as “traditional” Pecan Pie and was from a trusted source with dozens of positive reviews. While I can’t claim that this Pecan Pie tastes exactly like corn syrup-based Pecan Pies, it is amazing in its own right. The filling forms a thin, crispy, meringue-like top that browns as it bakes. Because the pecans are mostly under that crispy top, I pre-toast them to ensure they won’t be soggy. Most importantly, the custard filling is smooth, gooey and caramelly, with the out-of-this-world flavor we Pecan Pie lovers are craving. After a couple of delicious trial runs, I think that with having cut back the sugar and sweetness from the original recipe, I have struck the perfect balance. This is my favorite Pecan Pie ever. Preheat oven to 400°F (200°C). Roll out pastry, line pie plate and set aside to chill in refrigerator while preparing the filling. For the filling: In a large mixing bowl, stir together the flour, brown sugar, granulated sugar and salt. Add the cream and eggs and beat on medium speed for about 3 minutes, until sugar is mostly dissolved. Stir in the vinegar and vanilla extract. Stir in the butter and the nuts. Pour filling mixture into the crust and bake on a lower rack of the oven for 10 minutes at 400°F (200°C), then reduce the temperature to 350°F (170°C) and bake for an additional 30-40 minutes, until filling is set at the edges but still wobbly in the middle. If you find the crust or top to be browning too quickly, you can turn the oven temperature down to 300-325°F (150-160°C). Remove pie from oven and cool completely on a wire rack before slicing. Can be served chilled, at room temperature (my favorite) or warmed with a scoop of ice cream. Store tightly covered in refrigerator for up to 4 days. *To toast the pecans: preheat oven to 350°F (170°C). Spread pecans in a single layer on a rimmed baking sheet. Bake for 10 minutes, until fragrant and slightly darkened. Set aside to cool. 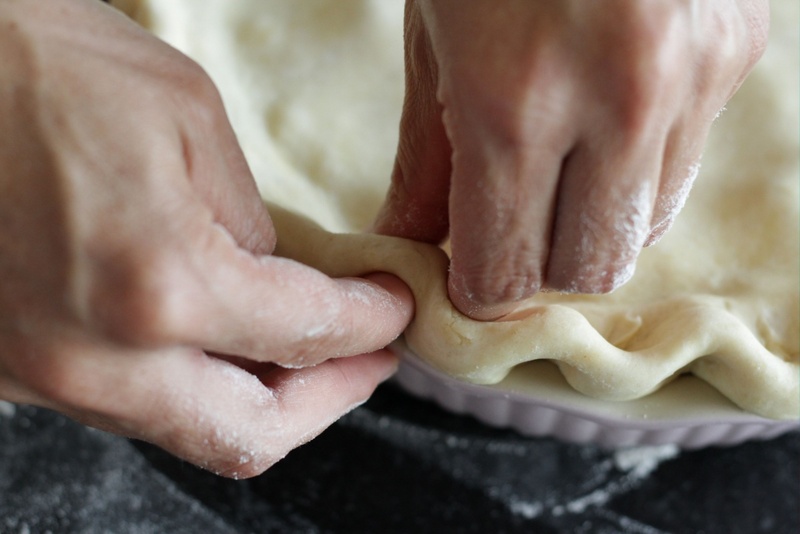 An elastic pie crust that doesn’t tear, is easy to work with, and always comes out perfectly. Recipe from Betty Crocker's Cookbook. Turn dough onto work surface and gently bring dough together with your hands, kneading only once or twice until you can shape it into a ball. Dough should appear somewhat rough and streaked – this ensures it will be tender and flaky. Cut the dough ball in half and wrap each half in a disk shape in plastic wrap and place in refrigerator to chill for 30-60 minutes. If making one single-crust pie, freeze the other dough disk in a zip-lock bag for the next time you make pie. Roll pastry on a well-floured surface with a floured rolling pin, rolling from center to outside edges in all directions. Turn pastry clockwise often to make sure it isn’t sticking to surface and use more flour if necessary. When dough circle is large enough to line bottom and sides of tart pan or pie plate, roll pastry around rolling pin and transfer it to the pan. Unroll pastry over pie plate or tart pan and ease it down the sides to make sure it is covering bottom and sides without being stretched. Using clean kitchen shears, trim overhang to about 1 inch (2.5 cm) and use scraps to patch any areas where there is too little dough coverage, pinching the dough into place. Fill pie shell and, if making a two-crust pie, roll out second pastry and lay it over top of pie and trim overhang to 1 inch (2.5 cm). Fold edges under, and press dough edges together with your fingers all around the pie plate, building up a rim. Pinch a fluted pattern into the edges all around the rim of pie. Bake according to directions in pie recipe. If you have a lot of scraps and don’t want to waste them, cut them into shapes if desired, lay them on a parchment-lined baking sheet, sprinkle with cinnamon-sugar and bake for 15 minutes to make “Cinnamon Crispies."